PPHS senior Lexi Watkins-Lovejoy (8) controls the ball during the Lady Knights match against Williamstown on Oct. 16 at the Shawnee Sports Complex in Dunbar, W.Va.
POINT PLEASANT, W.Va. — Although the season has ended, the Lady Knights are still garnering recognition. Point Pleasant senior Lexi Watkins-Lovejoy was named as the sole Lady Knights representative to the 2018 West Virginia High School Coaches Associations AA-A girls all-state team. Watkins-Lovejoy was listed as one of 15 midfielders who received honorable mention recognition. 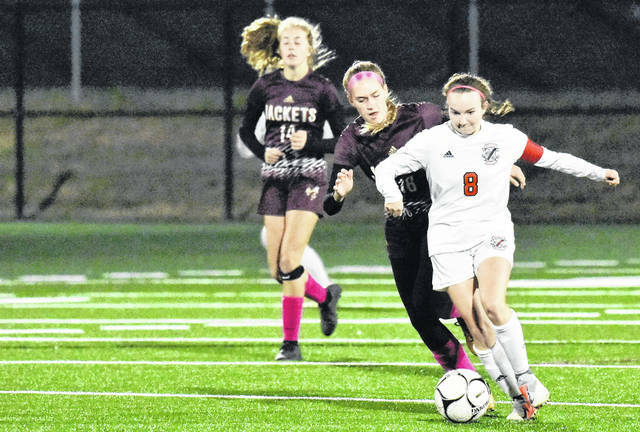 The West Virgina Sports Writers Association also recently released its 2018 class AA-A all-state soccer team, but no local athletes being named to the list of 75 selections. Maggie Kovalcik of Oak Glen was named the first team captain, while Jenna Jordan of Charleston Catholic was the second team captain. Forwards: McKenzie Moran, Huntington St. Joe; Maggie Kovalcik, Oak Glen, sr. (captain); Payton Frohnapfel, Winfield; Ashton McKane, Robert C. Byrd. Midfielders: Lindsey Carr, Charleston Catholic; Abi Hugh, Huntington St. Joe; Hannah Floyd, Fairmont Senior. Defenders: Kalei Jordan, Winfield; Jillian Williams, Oak Glen; Audrey Miller, Charleston Catholic; Olivia Arbogast, Bridgeport. Keepers: Emily Hudson, Winfield; Mara Rinehart, Williamstown. Utility: Kenadee Wayt, Wheeling Central; Courtney Smith, Oak Hill; Trisha LeMasters, Fairmont Senior. Forwards: Bella Cinco, Charleston Catholic; Reece Enochs, Oak Glen; Julia Gianni, Weir; Sofia Triplett, Elkins. Midfielders: Brooklyn Loveland, Oak Glen; Anna Gregor, Sissonville; Amelia Compston, Sissonville; Madison Smith, Robert C. Byrd. Defenders: Kristen George, Bridgeport; Jenna Jordan, Charleston Catholic (captain); Grace Cole, Winfield; Ireland Wayt, Wheeling Central. Utility: Elora Shinn, Nitro; Isabella Aperfine, Weir; Lura Simons, Robert C. Byrd. Alexis Adams, Weir; Dani Beverly, Logan; Nicole Billie, Wheeling Central; Kira Bircher, Pocahontas County; Diana Birchfield, Scott; Laila Calhoun, Pocahontas County; Hailey Chewing, Chapmaville; Sarah Crimm, Robert C. Byrd; Abbie Denham, North Marion; Payton Gregory, Philip Barbour; Macy Haddox, Magnolia; Anna Hewitt, Charleston Catholic; Savannah Hoff, Winfield; Mackenzie Hollaway, Weir; Brooklynn Hundley, Nitro; Olivia Krinov, Lewis County; Kali Krynicki, Madonna; Jillian Leo, Williamstown; Casey Martin, James Monroe; Kailey Mounts, Minto Central; Zoey McCutcheon, Sissonville; Lilly McMullen, Williamstown; Stephanie Miller, Bluefield; Abigail Myers, Oak Glen; Shayna Paxton, Herbert Hoover; Hannah Runions, Poca; Amelia Setser, Scott; Ember Smith, South Harrison; Tiara Snyder, Robert C. Byrd; Victoria Sturm, Lincoln; Addyson Thomas, Wheeling Central; Brayylyn Travis, Philip Barbour; Makayla Virden, Madonna; Brooklyn Watts, Oak Glen; Rikki Wellman, Mingo Central; Maddie Wilson, Bridgeport; Alison Woolum, Mingo Central; Morgan Wylie, James Monroe.